fragrances that is Mogra and Rose. The smell of these two kinds of detergent powder is good and that is why we donï¿½t need to use any perfumes after washing the clothes using this detergent powder. This detergent powder is strong and cleans the clothes very well. the clothes in any way. The colours of the clothes do not fade and even the clothes do not get shrink when we use this detergent power. can also be used for the washing machines. The cost is normal but gives the best quality wash. This is good and i recommend the Arial fresh for all the housewives. 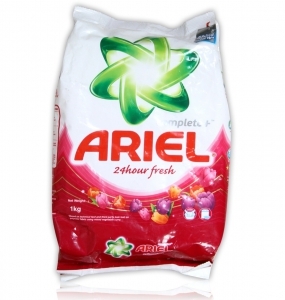 When it comes to washing our clothes, Ariel Fresh Detergent Powder is the product we can lean on. Ever since I was a kid, my mom was already using this product and I can tell why. The way it cleans our clothes is purely high quality but the price is still affordable. It leaves our clothes fresh and clean. No stain, no damage, no unwanted discoloration. What else? It gives a naturally floral fragrance that you don’t even need to put a freshener. I don’t even put on perfume cause the detergent’s fragrance is enough. Ariel Fresh Detergent Powder always exceeds my expectations and leaves us with the best experience. I would highly recommend this product to those who want a detergent powder which can give high quality cleaning at affordable prices. Yes the cost is pretty much low and i love the way it washes away all the dirt in a few seconds.My mother uses it daily and it is now proving to be very helpful on cleaning clothes. this product is worth buying.